Here in Michigan, snow and ice dams can prove to be a hazard on your roof. Throughout the winter or during a blizzard, snow buildup can become heavy, which means that your roof may be in danger of damage or a complete collapse if its poorly supported. Beyond that, ice dams (which can form as snow melts and refreezes) can cause even more issues, and may lead to a roof leak. That’s why it’s so important to stay on top of the snow and ice on your roof — figuratively speaking. Here are a few tips and guidelines that you can employ to ensure that your roof remains free from winter’s hazards — as provided by Michigan’s roofing experts here at Rock Solid Exteriors. When Should I Remove Snow? While a bit of snow won’t harm your roof (in fact, roofs are designed to hold several inches of snow), too much snow can prove to be a problem. Most roofs are designed to hold up to 20 pounds of snow per square foot before they begin to fail. However, if your home is more than 75 years old, that number may be lower. You should remove snow from your roof based on the amount of weight of the snow, not just the total height of snow accumulated. If your home has accumulated lots of light snow (more than two feet), then you should remove it. In addition, if your roof has accumulated a foot or more of heavy, wet snow, it should be removed. Don’t forget, it’s likely that you’ll have a thin layer of ice on your roof as well, which means that you’ll need to perform snow removal before it reaches the heights we just mentioned. If you’re concerned about your roof, there are a few telltale signs that indicate the snow it holds is too heavy. Be wary of popping and cracking noises from your attic. Also, listen for creaking, which may indicate that your roof is sagging. Leaks are a telltale sign that your roof is already failing, and you may have issues with ice damming on your abode. If you notice any of these signs, you should act right away to relieve excess pressure on your roof. While you may be able to perform snow removal on your roof by yourself, we recommend that you hire a professional crew for a few reasons. First and foremost, removing snow from your roof can be dangerous, especially if you have a sloped roof. You can injure yourself if you’re attempting to scale your roof to remove snow. If you’re using a snow removal shovel that you use from the ground level of your property, you should still remain vigilant, since snow can slide off at any moment — effectively turning into a small avalanche. A snow slide can be especially dangerous, since snow can come sliding off by the ton. You should also consider hiring a professional roof snow removal company if you are concerned about voiding a roofing warranty or incurring damage to your roof. Some roof warranties only remain valid if you don’t damage your roof, either intentionally or unintentionally. So, if you get on your roof yourself, and end up cracking a few slate tiles or damaging a few shingles, you could void your warranty and end up with an expensive repair ahead. Roof snow removal companies should have the right tools and they should use the right techniques to ensure that your roof is free from damaging snow and ice, without damaging your roof in the process. 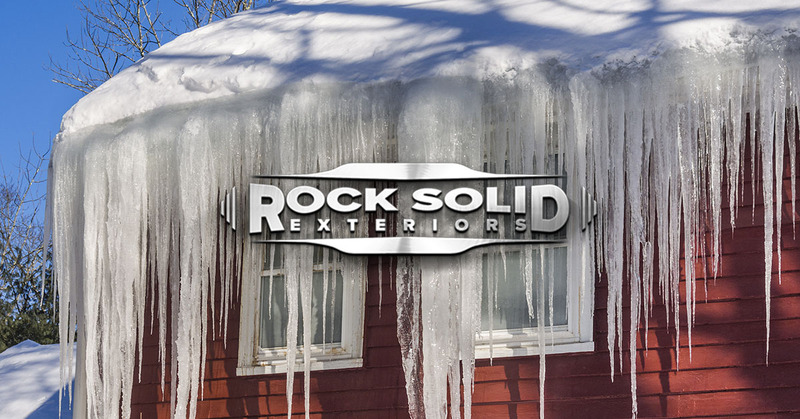 After a rough winter, you can count on the roofing crew here at Rock Solid Exteriors to repair or replace your roof. We understand how damaging a winter can prove to be here in Michigan. You can always trust us to ensure that you have a trustworthy roof over your head. Give us a call to get your project started!